Move your vinyl cut outs from the cutting mat to your wall or window with ease! 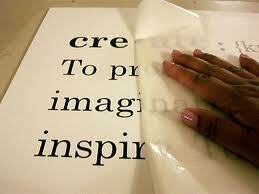 This transfer paper will make it a simple task to arrange and place your vinyl décor exactly where you want it to go. This roll does not have a backing - it is a continuous roll of transfer paper which has an adhesive side after unrolling it.